NASA has released the first images taken during New Horizons’ historic flyby of dwarf planet Pluto. 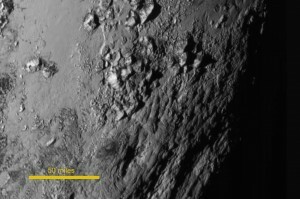 NASA released its first closeup image of an area near Pluto’s equator Wednesday, which contains a range of mountains rising as high as 11,000 feet above the dwarf planet’s icy surface. “These mountains are quite spectacular,” said Spencer. The image was taken about an hour-and-a-half before New Horizons’ closest approach to Pluto, when the craft was 478,000 miles from the planet’s surface. NASA also released an image of Pluto’s largest moon Charon, which clearly shows a swath of cliffs and troughs stretching about 600 miles across its surface.